Dear Portia: Do I forgive my church family, or speak up? Several years ago, our family got involved in fostering children with significant medical needs. The nudge to do so came from the teachings of our church…to love God and to love people. But, the very church family who encouraged us to jump in did not throw the life-preserver we expected. Fostering got hard. Much harder than we thought it would. And our church family all but disappeared. We are now in a season of rest from fostering, and I’m struggling to find the grace to serve the people who turned away from us in our time of need. Do I forgive and forget? Or do I challenge the actions, (or, really, non-actions) of our church family members? Right after I gave birth to my first child, my husband and I realized, as new parents do, that we were completely out of our depths. I’d nearly hemorrhaged during delivery, and was struggling to recover. We needed help. I reached out to someone I trusted, someone who had told me ahead of time they’d be happy to be involved after the birth. I’m don’t find it easy to ask for help, but that morning I was so desperate, so needful of practical assistance, that I swallowed my pride. But when I called that person, they said no quickly, without asking questions or hearing how physically weak I was. No, they were not available to help us. Sorry, they said, offhand. What hurt me most was their nonchalance, and their lack of curiosity. I had never asked this person for help like this. I was so desperate—and they barely gave me a hearing. I heard a similar story from a woman a few years ago. She’d been struggling with sleep with her first child, and she asked her husband to help her with a night shift during the weekends. He had a flexible schedule for work. No, he said flatly. No good reason. No empathy. He just didn’t feel like helping her. And the question she was left with, I was left with, and you were left with is this—where do I go from here? Or as you put it, do I forgive or challenge? I wish I had an easy answer for you, but I don’t. Instead, I’m going to suggest a few questions to ask yourself as you navigate this wrenching disappointment. What level of relationship do you have with the people who hurt you? Are they people with whom you share life with, or people you say hi to on Sundays? You’ve probably drawn back from relationship with each of them since they disappointed you. Do you want them to regain your trust, or are you content with the distance that set in? How will keeping that distance affect your ability to stay at your church? Do you have a sense about how healthy, gracious, and empathetic they each are? Do they listen to criticism and respond with repentance? Or are they dismissive and defensive? How angry are you? Is your anger keeping you up at night? Is it turning into bitterness? Do you want to speak up? I’ll address each one in turn. This question addresses how much time and energy you should spend repairing the relationship with each of the people that hurt you. The closer people are to your heart, the more time and energy it’s worth spending to fully pursue reconciliation. A spouse, parent, or child would be worth a lot of energy; an acquaintance, not so much. 2. Do I Want or Need to Repair Things? This relates to what we’re actually talking about when we say “forgiveness”. Because honestly, a lot of people say “forgiveness” when they mean “reconciliation”—and they’re two different things. Forgiveness means asking for God help to let go of bitterness and resentment towards the person who hurt you–it doesn’t require the other person’s involvment. Reconciliation, however, means restoring the intimacy you had with them before they hurt you. Repairing things with an entire church family is more complicated, because even if each person isn’t close, feeling alienated from everyone is terrible. Again: would you need to leave the church if things stay the way they are now? Do you want to remain there, and desperately need people to repent in order for that to happen? If keeping quiet would ultimately destroy your connection your local body of Christ, then you probably need to speak up. Pursuing reconciliation is exhausting, nerve-wracking, and only works with people who are willing to repent. So the third question helps you evaluate whether all that energy will possibly bear any fruit. With an entire church family, try to evaluate what the organizational culture is like. How are conflicts usually handled—with transparency and accountability, or with gossip and shaming? If leaders disappointed you, are they humble and approachable? Have others been shamed or ostracized for being honest during conflicts? Try to be realistic about this. Better to leave a church than knowingly expose yourself to spiritual abuse. 4. Would Speaking Up Help ME? Finally, is the hurt and anger balled up like a lead weight in your stomach, growing each day? Or does it feel like it’s easing as you have time to heal? If bitterness looms, it’s probably a good idea to say something, regardless of whether it leads to reconciliation. Not because you owe anyone else something, but because it’s worth honoring your own pain, and allowing yourself to own your own story. 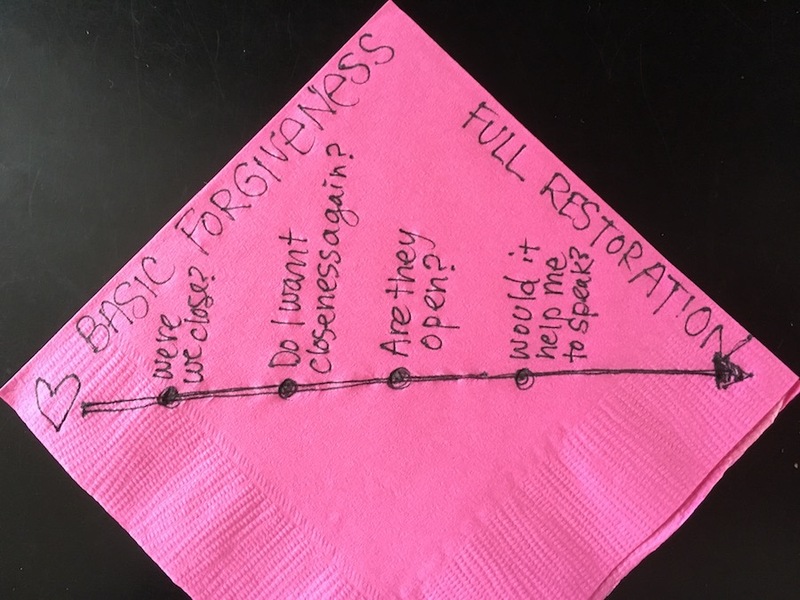 Imagine these four questions creating a kind of spectrum of reconciliation. I wrote them on a pink paper napkin to illustrate. Because why not. If the person is an acquaintance, and you’re okay with the distance created by their actions, and besides which, they respond terribly to any critique, and you feel peaceful about keeping your peace, save yourself a lot of heartache and further disappointment. Just seek basic forgiveness with God’s help. If however, this person is your best friend, you feel like the distance between you hurts you, and they’ve responded well to hard conversations in the past, go for broke. You really don’t have anything to lose. Where does your church family fall as individuals? As a group? Are there key people you could approach (leaders, for instance) that could stand for the totality? Or has the disappointment so damaged your connection to the church, and they are so defensive and unrepentant that you need to consider leaving if you don’t say something? This isn’t a magic formula—people are complicated, so they could be an awkward mix of super-close friends and horribly defensive, or open to repentance, but not close enough to justify the output of energy it would take to tell them how much they hurt you. So I’d use this question as a tie-breaker. What do you want to do? What would free you or give you peace? The truth is, you’ve been through the wringer this year, and deciding that you don’t have time or energy to spend pursuing reconciliation with these people is totally okay. You don’t owe them anything. If you’re not sure what to do, that’s okay too. Give it some time, and keep rolling these questions around in your head when you are in fellowship with your church. Regardless of whether you speak up or not, keep telling God about your rage, anger, bitterness, and sadness. Ask for his help in healing your heart. Feel all of your feelings. Forgiveness will come with God’s help, with time. I’m praying that whatever you decide, that you find deep healing and wholeness as you journey through this grief. This entry was posted in Church, Community, Dear Portia, Faith, Relationships and tagged Caliri, church family, Church Fellowship Faith, Dear Portia, disappointment, forgive, forgiven, forgiveness, forgiving, foster, foster care, Heather Caliri. Bookmark the permalink.